International Airlines Group is one of the world's largest airline groups with 573 aircraft flying to 268 destinations and carrying around 113 million passengers each year. It is the third largest group in Europe and the sixth largest in the world, based on revenue. 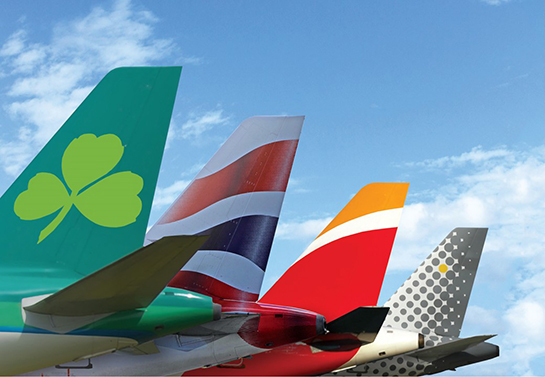 Formed in January 2011, IAG is the parent company of Aer Lingus, British Airways, Iberia, Vueling and LEVEL. It is a Spanish registered company with shares traded on the London Stock Exchange and Spanish Stock Exchanges. The corporate head office for IAG is in London, UK. In 2017, IAG launched LEVEL a new low cost airline brand which flies longhaul from Barcelona and Paris and shorthaul from Vienna. IAG combines leading airlines in the UK, Ireland and Spain, enabling them to enhance their presence in the aviation market while retaining their individual brands and current operations. The airlines' customers benefit from a larger combined network for both passengers and cargo, and a greater ability to invest in new products and services through improved financial robustness. Aer Lingus is the national airline of Ireland, founded in 1936 who primary mission is ‘To Connect Ireland to The World’ by providing customers with convenience, choice, comfort, value and seamless transfer options - making Aer Lingus the smart choice. It is Ireland’s only 4-Star airline having received a 4-Star rating from Skytrax, the international air transport rating organisation, in July 2016. With its fleet of 65 aircraft, Aer Lingus operates from central airport locations in the UK, Continental Europe and North America on over 100 routes, carrying 12 million customers per annum. Aer Lingus’ home base is Dublin Airport where customers can choose from 13 North American destinations with more than 100 onward connections across the U.S and Canada, available with our partner airlines. Dublin Airport is the only major airport in Europe to offer U.S preclearance, which enables passengers to save time on arrival in the U.S by completing all the necessary immigration and customs checks prior to departure. British Airways is the UK's largest international airline and one of the world's leading global premium carriers. Its principal place of business is London, the world's largest premium travel market, with significant presence at Heathrow, Gatwick and London City Airports. It is expanding its schedule from Stansted, Manchester, Birmingham and Bristol Airports. British Airways’ main home at Heathrow is Terminal 5, regularly voted by passengers as the world's best airport terminal in international surveys. British Airways is a founding member of oneworld, the alliance of airlines around the globe, which together serves some 1,000 destinations across the globe. Founded in 1927, Iberia is today the leading airline between Europe and Latin America, where it launched regular services in 1946. It is also the air group offering better connections from Spain to the rest of the world. Together with its low-cost carrier Iberia Express and its franchise airline Iberia Regional Air Nostrum, Iberia operates some 600 flights each day to some 124 destinations in 48 countries, with a fleet of 135 aircraft. Under code-sharing arrangements with other airlines, it offers flights to another 273 cities in 56 countries, 94 of them are in Latin America. Iberia operates some 230 flights each week to 18 Latin American destinations, with connections at its Madrid T4 hub to more than 77 cities in Europe, Africa, and the Middle East. After implementing its Transformation Plan, Iberia returned to operating profits in 2014 and it is now implementing its Plan de Futuro 2 to ensure the company’s growth and sustainability. In 2016, Iberia became world’s most punctual carrier. Vueling started operations in July 2004 with an initial fleet of two Airbus A320s serving four routes aiming to provide excellent customer service at a competitive price. Thirteen years later, Vueling is the leading airline at Barcelona-El Prat Airport and is operating more than 345 routes to 137 airports in Europe, Middle East and Africa. It has 20 operational bases and 108 aircraft. LEVEL is International Airlines Group’s (IAG) new low cost longhaul airline brand that took to the skies in June 2017. Initially, it is operating two A330-200 aircraft from Barcelona to San Francisco (Oakland), Buenos Aires and Punta Cana with a summer service to Los Angeles. Boston will replace Punta Cana in March 2018 and a third A330-200 aircraft will be added to its Barcelona fleet in summer 2018. In July 2018, LEVEL will launch flights from Paris Orly to Montreal, New York, Guadeloupe and Martinique. It will base two A330-200 aircraft at Orly, LEVEL is bringing a stylish and modern approach to flying at prices that are even more affordable. Its customers are able to earn and redeem Avios – the loyalty currency for IAG’s airlines. LEVEL is IAG’s fifth main airline brand alongside Aer Lingus, British Airways, Iberia and Vueling.